The construction of the three railways in Sutton, the London and North-Western Railway Sutton Branch in 1862, the Midland Railway of 1879, and the Lichfield Extension line of 1884 each made an impact on High Street. At first the effect was indirect, the conversion of a fine house in High Street, once the residence of gentry families, the Willoughbys and then the Grundys, into a hotel. The new tenant did not meet with approval, as recorded by Sarah Holbeche “November 2nd 1859 Opposite house taken by Giles and forthwith appeared emblazoned “Railway Hotel” before the railway itself was a fact” (this is now the Royal Hotel). A few years later the opening of the Sutton Branch railway prompted speculators to build a very grand hotel overlooking the station, requiring the demolition of property both on the site and to make an access road (now King Edward Square). Joseph Genders the butcher had already built a cafe to attract railway passengers behind his High Street shop, but, Miss Holbeche noted in her Diary, “December 18 1864. The Hotel Company bought Genders property including shop and newly erected refreshment rooms, giving £1400, - all to be pulled down. There is such a thing as ‘paying dear for a whistle’”. Sarah Holbeche had left Sutton by the time the house she had lived in for many years was demolished in 1878 to make way for the next railway, the Midland Railway through Sutton Park. Her house, next door to 56 High Street, and the old malthouse beyond stood in the way of the railway, here in a deep cutting, so even its cellars were taken away. Access to Sutton Town station on this line was originally along a lane leading from Lichfield Road alongside the railway (this track still exists), but the need for a proper approach road soon became clear. The house in High Street where Richard Yeld lived, a master at Bishop Vesey’s Grammar School who took in boarders, was demolished to make way for Midland Drive. In 1880 the London and North-Western Railway obtained its Act of Parliament for the Lichfield Extension Railway. This was for a route tunnelling under High Street and crossing beneath the Sutton Park line before turning north. The railway company purchased the High Street properties which stood above the planned tunnel. On the west side of High Street, just below the Three Tuns, stood three shops in one of the last surviving half-timbered buildings in the street, Long the butcher, Orme the baker and Sidwell the painter They were demolished to make way for Railway Road, which is directly above the tunnel. 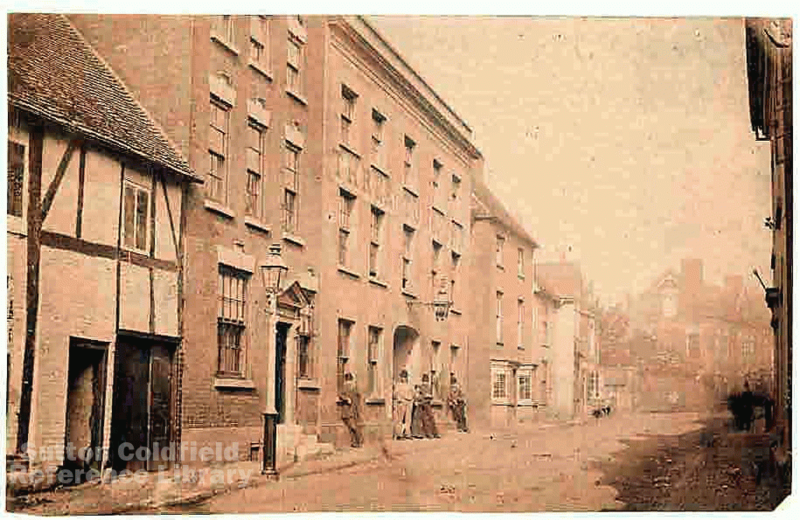 On the other side of High Street were two shops with a yard at the back giving access to seven cottages; the shops and three cottages were knocked down but the other four cottages are still there today in Old Bank Place.